Okay guys. I want to be serious for a second. Today, no jokes about handjobs from Wolverine or taking cheap shots at Microsoft. Or Harrison Ford. Or Goku’s father skills. When you get down to, it I actually do take a lot of cheap shots, but not today. Today I want to shoot straight and talk about the best goddamn superhero movie of the 1990s: Batman Returns. I myself only rediscovered this movie a few years ago with fifteen years in between that and my last childhood viewing, and the first thing that surprised me is that Batman has virtually no emotional arc. He has no strong relationship, antagonistic or otherwise, with the Penguin, with Commissioner Gordon, with really anyone other than Catwoman. Even this relationship is fairly simple – he likes her and she likes him. It sounds here like I’m complaining, but in fact I was fascinated by the Batman character’s retreat deeper into the background. Oh, there’s some hinted nonsense about his trouble with relationships, but this seems less about creating his story and more about supporting Catwoman’s. Unlike the Dark Knight trilogy, where Bruce Wayne’s each emotion is bashed into the audience’s face, the images we have of Batman here are quiet and brief. Wide shots of our hero in Wayne Manor’s large rooms leaving him in a yawning emptiness. The movie gives us in a whisper that our hero is lonely, and that his crusade is slowly pulling him into oblivion, but is otherwise content to loan him out as Catwoman’s love interest and in the meantime, unleash him on Gotham as a dark force of nature. A quick side-rant: The problem with heroines these days who fall under that much-overused label, “strong female character,” is that their propagandistic characterization often leaves them too perfect to care about. They become madonnas of plot, bereft of any character flaws which run deeper than sympathy-begging “quirks.” Superhero moviedom’s latest leather-clad lady, Black Widow, illustrates this perfectly. She comes into most every situation with total power, easily manipulating men and gods and never making a decision which is not the best possible decision. It’s not any surprise she falls a little flat next to Robert Downey Jr.’s eminently fallible Tony Stark or Mark Ruffalo’s whipped-puppy Bruce Banner. 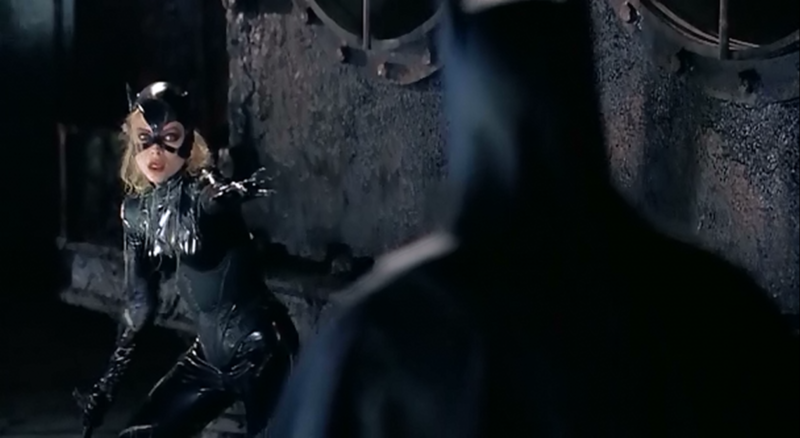 But not even the stars of the colorful cast of The Avengers has anything on the explosively pained, fantastically fractured Catwoman of Returns. Selina Kyle’s deliciously twisted moral crusade against Christopher Walken (whose character has a name, but it doesn’t matter because Christopher Walken always plays Christopher Walken and I wouldn’t have it any other way) is married to a rich humanity imbued in her character by her bad decisions and little failures. Because she is technically a “villain” the movie is comfortable smacking her down with the sort of karmic retribution usually reserved for black hats. What I’m saying is, you won’t see Scarlett Johannssen (or Anne Hatheway, for that matter) getting dropped into a dump truck of kitty litter any time soon. And somehow, the fact that these things can happen to her make her victories mean more. Danny Devito’s Penguin here is, it must be said, the greatest incarnation in any media of this largely discarded but essential Batman villain. Although his venomous attitude and colorful resources make him the obvious main antagonist, his narrative is unique among villains of superhero flicks in that his position is always precarious. Even after he’s clawed his way out of the sewer and into the public eye, he is no less the victim of forces outside his control, as he is swallowed up in Christopher Walken’s machinations. My feelings toward the Penguin were always an entanglement of revulsion, sympathy, and even some fear. His sad and haunting origin introduces the movie, ending with that unforgettable baby carrier being tossed into the snow-dusted river. Indeed, the movie makes clear he never quite escapes that carrier, with his malformed, infantile body and stained onesie. 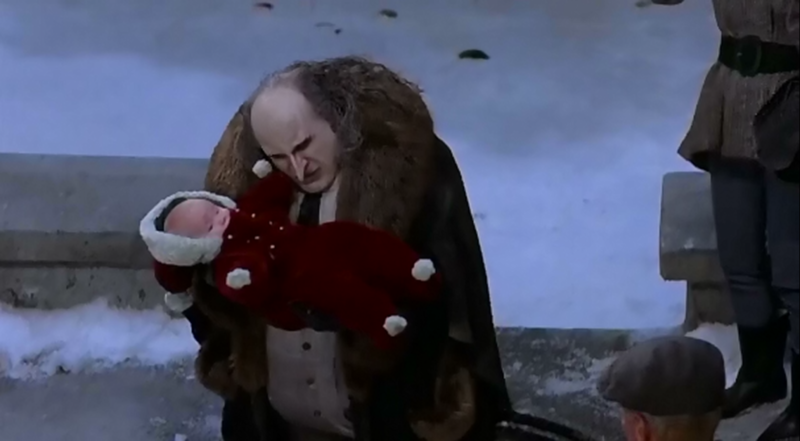 But perhaps the way the Penguin best shines in this film is the living metaphor of Gotham’s corruption. 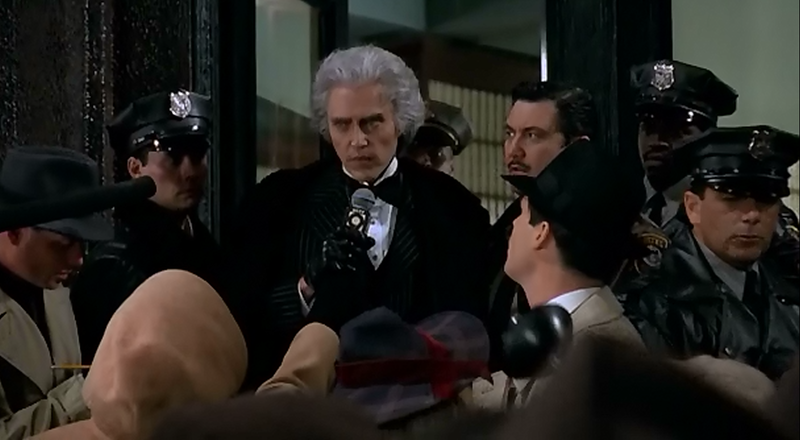 Christopher Walken, the mayor, and other high-stakes players in Gotham’s future bat at each other from the boardroom to the stage of a press conference, sometimes just outside the range of the microphones. The Penguin is a snarling joke of a gentleman, his fine garments barely containing his odious presence, and yet we see that the 1%-ers around him are no less monsters. Oh, another thing I loved about this movie: it’s insane. Christopher Walken’s plans to build a power plant which actually usurps power (why? It’s never explained, maybe to power the blowdryer he uses for that hair), and to do this he needs a new mayor who will get behind his “I can do whatever I want” platform. To this end he decides to push, as a candidate for mayor, a man who has lived in the sewers for thirty years. “But David, some of those thirty years he spent in the circus!” Alright, so he was in the circus for some of that time too, but unless there’s sword-swallowing at the city budget meetings it makes him no better qualified. And also, irrelevant, because the public has no idea he is connected to the circus, or indeed connected to anything except rafting on their underground poop rivers. And let’s not forget that Penguin’s ultimate plan involves an army of penguins with rocket-packs, whom he gives a Pattonesque speech that they all seem to understand. Does it make sense? No. Do I love it? You bet the pointy tips of Batman’s ears I do. Something that comes up a lot these days about the Burton films: does Batman kill in this movie? Probably not. I mean, yes, he does stick a bomb in someone’s pants and then throws him down a manhole and walks away while he explodes. That does happen. But every supposed henchman “death” in the Burton movies is like this; an over-the-top cartoon finish. In a different age of TV and movies, these instances were cinematic shorthand commuting the suggestion of real harm, a chance for the movie to “act out” without interrupting its own tone. Ultimately, this is a movie which deserves to be remembered for all the ways it’s enjoyably different from what’s become standard superhero fare. There is only the barest dalliance with a damsel-in-distress, and the situation is a vile twist on the expected rescue scenario. The love interest doesn’t need saving, would rather die than retreat into reliance (which, due to her warped worldview, are her only two options). The villains aren’t all-powerful and even constantly threaten to topple each other. 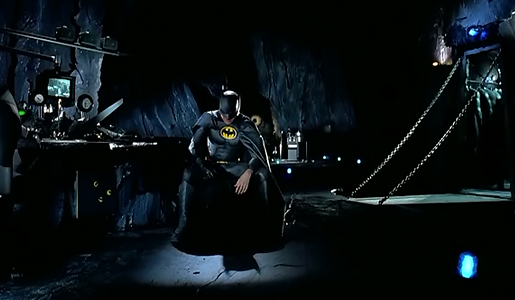 It saddens me thinking what we could have gotten with a third Batman movie from Tim Burton. But, we probably just would have gotten that Johnny Depp Riddler everyone wanted so much from the third Christopher Nolan movie. Do you agree that Batman Returns is the greatest superhero movie of the 1990s? Got your own ideas on what movie deserves that praise? Let us know in the comments!